Joe Paterno died, and we pundits rush in to define the man. Joe Paterno died not long after reports surfaced that he was in serious condition. "If we're so able to vividly remember the worst a man did, can't we also remember the best?" Ivan Maisel: "The Sandusky scandal has revealed that Joe Paterno missed in real time what may be seen so plainly in hindsight. The scandal has cast a shadow over a brilliant coaching life. But even the darkest of eclipses are temporary. To say that this scandal should obscure all that came before it ignores the meaning of legacy." Jack McCallum: "He was not a perfect man, but he was a man who did more good than bad, someone who made a difference, someone who will be remembered. 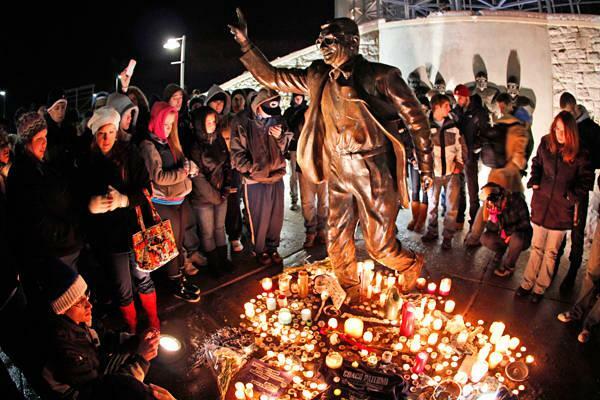 As news spread about Paterno's increasingly grave condition last Saturday night, students spontaneously gathered at Beaver Stadium, clustered around the seven-foot statue of him running onto the field, right index finger raised. Behind the statue is a plaque on which Paterno is quoted: 'They ask me what I'd like written about me when I'm gone. I hope they write I made Penn State a better place, not just that I was a good football coach.' He wrote his own epitaph. LaVarr Arrington: "The biggest tribute I can give to Coach Paterno is taking all that I've learned from him and apply it in my life. I, too, someday will cease to exist on this earth physically, but to know that my good works impacted someone so much that they would speak of me the way I speak of my former coach today, that's the best way for me to honor the man who for three years taught me in his own way what it took to be a man." If you've read my report on how the Penn State scandal affected Erie, you know I have a more nuanced, less charitable view of the man. To me, the Sandusky scandal was representative of a greater scandal, that of the predominance and professionalization of college sports. Sanduskly exposed the program with the best reputation as being made from the same material as the worst. He was a husband and he was a son and he was a father. He was right and he was wrong, and like most of us, he did his best. A hero to millions, in his own telling he failed his greatest challenge. If it came to that, could you do right if it cost you everything? Would you sacrifice yourself and all you've built to save a stranger? Joe Paterno was no more and no less than human, and no living man can contend with his own legend. No man can live in his own shadow. A bronze statue of Joe Paterno standing seven feet high and weighing 900 pounds was swung into place at Penn State on Nov. 2, 2001. Four months later to the day, March 2, 2002, Mike McQueary stood at Joe Paterno's door. He had a terrible story to tell. There was a kingdom. A beautiful princess. A boy and girl who lived with their father, a woodcutter. A valley of happy and prosperous people built around a venerable university. A beloved football coach. That's how fairy tales start. And then a shadow descended over the land. A monster roamed. But there's no ball, no dance with the prince at the end of the Penn State scandal. No monster is slain, no kingdom won. This story has no happy ending. And if there is an ending, it's a stage littered with the dead. It's Hamlet, and we are Fortinbras, rushing in among the corpses of the House of Denmark. After it's too late. And Joe Paterno is a character from a rougher, more ancient tragedy. A Greek king, overly proud and ambitious, who lost an empire to hubris – "exaggerated pride or self-confidence," says Merriam-Webster's – but unlike Oedipus, say, Paterno did not strike out his own eyes in remorse. Instead, our hero exits stage left, grumbling about his treatment and still oblivious to what he'd done. Of course, in reality, the Penn State scandal is no work of literature. There are no heroes, no protagonists. Only an unknown number of boys as young as ten living out a nightmare: Alone in the dark, clutching bedcovers. Hearing a slow footstep in the hall. The boy yells for help, but on one hears, except for whoever – or whatever – is in the hall. There's another footstep. And another.